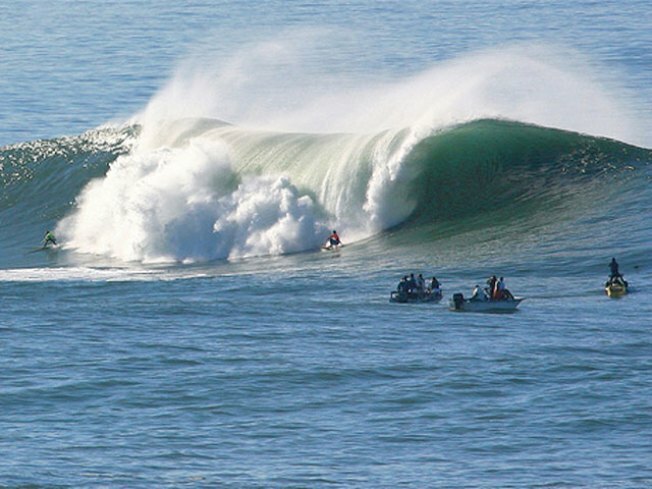 You've probably heard about the epic waves this weekend at the Mavericks surf contest. Some experts say they were the biggest waves ever for a competition. The surf competition turned out to be even more hazardous for those watching the giant waves. High tide coupled with the peak westerly swell (near 20-25ft.) resulted in some waves washing over some of the viewing areas near the A/V scaffolding and booths. Many people were swept off their feet, and at least 13 were treated for various injuries. The injuries to three people were serious enough to require a trip to the hospital, including one person with a broken leg. Scary for sure, and it serves as a reminder to everyone that during a high surf warning - to use extreme caution near the coast. A high surf advisory continues through midday today for waves in the 12-16 ft. range.